ISA presents to you iNight, the biggest annual international event on campus. 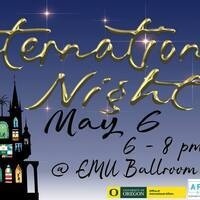 It is a night full of performances, activities, and food to celebrate all cultures together as one. You don’t want to miss this night since we will be providing you a 3 course meal while watching awesome performances ranging from an International Fashion Show representing all countries around the world to individual cultural performances. You especially don’t want to miss out on our prizes. Come attend to get the chance of winning a GoPro. Doors open 5:30 PM and the Show start promptly at 6 PM so please come early! Enjoy the Emerald Photo Booth at the lobby while you wait! Create awesome memories with your friends and have access/keep the photos!